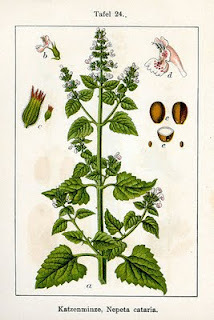 Catnip, Nepeta cataria, the beloved herb of felines, also makes a soothing, if not particularly tasty, tea for humans. Adding lemon balm and honey will make it more palatable. 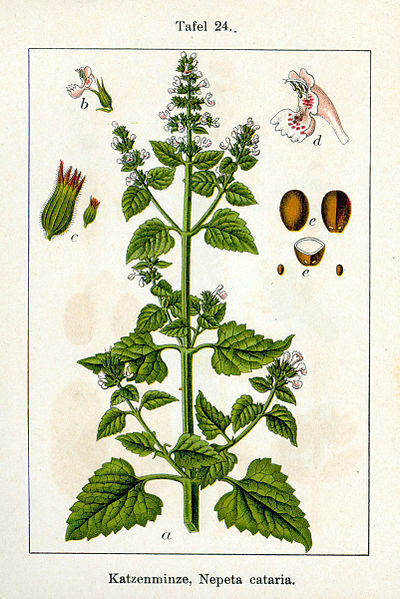 Catnip is said to be calming, as well as helpful in lowering fevers, relieving the pain of teething and toothache, and a restorative digestive aid for issues such as indigestion, diarrhea, and colic. From Back to Eden, by Jethro Kloss- "If every mother had catnip herb on the shelf, it would save her many a sleepless night and her child much suffering." If you sow it, the cats won't know it. Great post! We love catnip tea in our house. When my daughter refuses to sleep, we quickly brew up a bit, and it always does the trick!